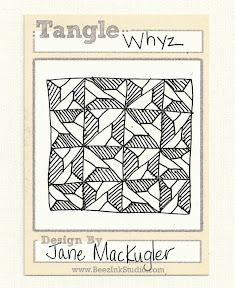 Here's a new tangle for you. Last week I called it Y-Knot but was notified that Molly Hollibough has a tangle similarly named so I changed the name to Whyz because you create it using Y's. ooh, this one is fun... i'll have to try it some more!! This one is so cool and actually pretty easy to do. I Love it. How exciting Janee, your famous! 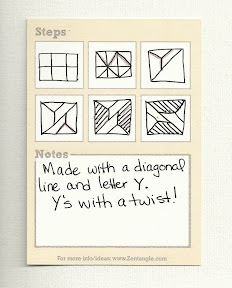 Great tangle, I look forward to trying it. Congrats on being the UMT XIV challenge this month! Cool pattern with so much potential. Thanks, Janee. How I love this pattern! So glad it is the umt for the month of March! Ummm, actually, I don't know the name of your blog as i got here through the Diva's challenge connection. I thought it might be See Jane but googling that brought me to someone else's blog... So, what is the name of your blog :)? Thanks for trying out Whyz! I don't see your name on the Diva's Challenge list; I'd love to see what you did. A big thank you to all of you for trying out Whyz! You folks are the best!